New Ways to Play and Share Your Mario Fun! 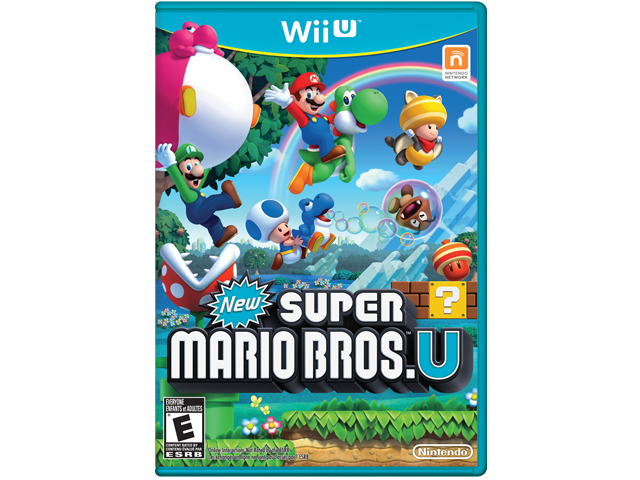 New Super Mario Bros. U™ is a new, side-scrolling adventure featuring Mario™, Luigi™, Toad™ … and your Mii™ character. Now’s your chance to step inside the Mushroom Kingdom and explore new worlds, new power-ups and new ways to play. Up to five players can jump into the fun, with up to four people using Wii Remote™ controllers and one on the Wii U™ GamePad. The experience is different, depending on which controller is used. The Wii U GamePad controller offers a new way to experience multiplayer Mario fun. Create Boost Blocks out of thin air to help players navigate tricky stages or access hidden or hard-to-reach items, and distract onscreen enemies, all with the tap of their finger or stylus. Swoop through levels and cling to walls when Mario transforms into Flying Squirrel Mario, or gently float through the air while hanging onto Balloon Baby Yoshi™. Boost Mode also makes cooperative speed runs possible for the first time. Use the GamePad to interact with and manipulate enemies and objects in real time, and discover new ways to find the fastest route through each stage. Play on the big screen or the small screen. Switch single-player gameplay from the TV to the GamePad at any time to continue playing even when others are using the TV.